Periodicity Review. 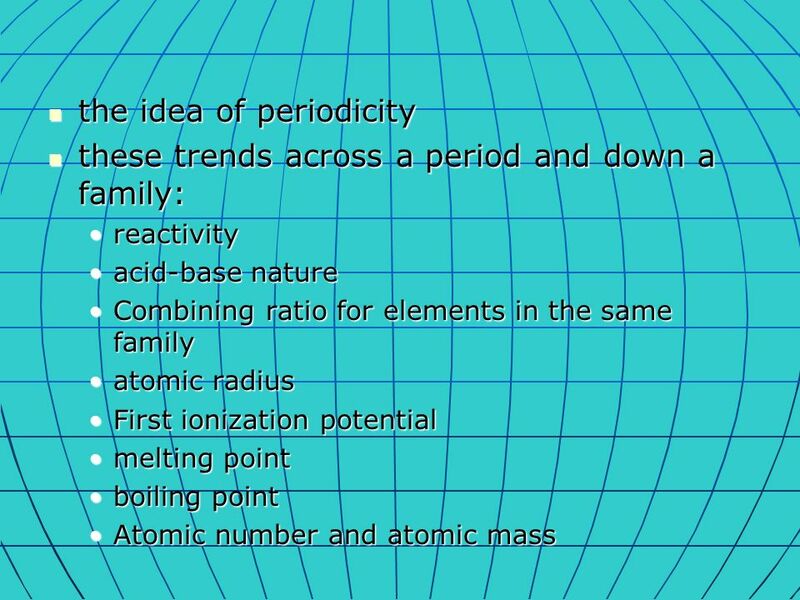 the idea of periodicity the idea of periodicity these trends across a period and down a family: these trends across a period and down. 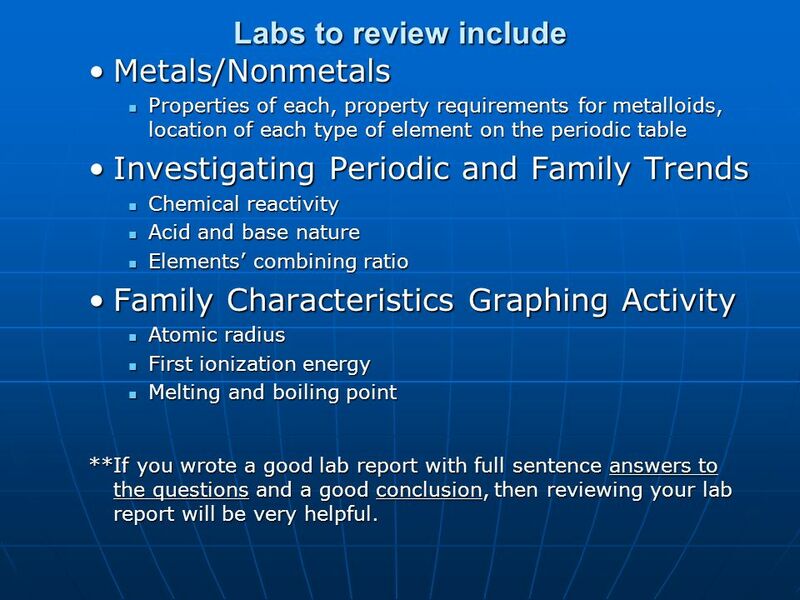 3 Labs to review include Metals/NonmetalsMetals/Nonmetals Properties of each, property requirements for metalloids, location of each type of element on the periodic table Properties of each, property requirements for metalloids, location of each type of element on the periodic table Investigating Periodic and Family TrendsInvestigating Periodic and Family Trends Chemical reactivity Chemical reactivity Acid and base nature Acid and base nature Elements combining ratio Elements combining ratio Family Characteristics Graphing ActivityFamily Characteristics Graphing Activity Atomic radius Atomic radius First ionization energy First ionization energy Melting and boiling point Melting and boiling point **If you wrote a good lab report with full sentence answers to the questions and a good conclusion, then reviewing your lab report will be very helpful. 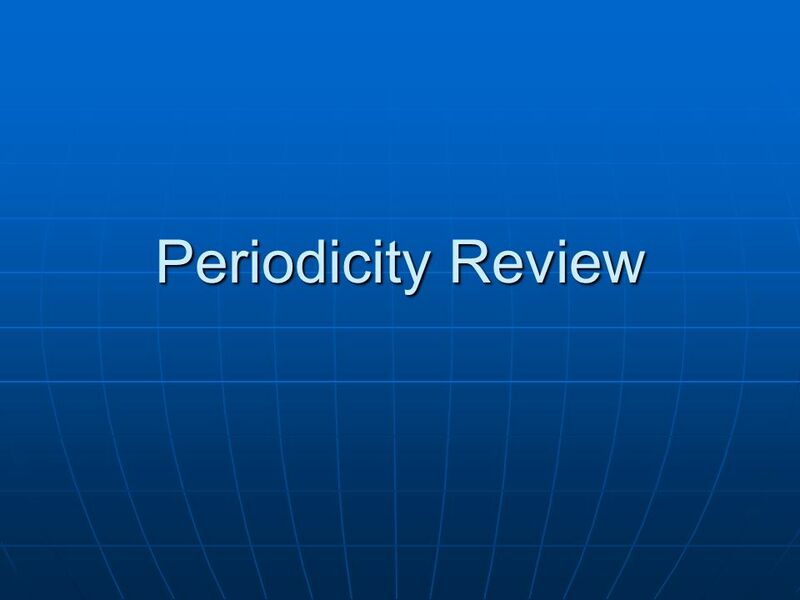 Download ppt "Periodicity Review. the idea of periodicity the idea of periodicity these trends across a period and down a family: these trends across a period and down." Chemistry Daily 10’s Week 8. Identify properties of groups on periodic table. 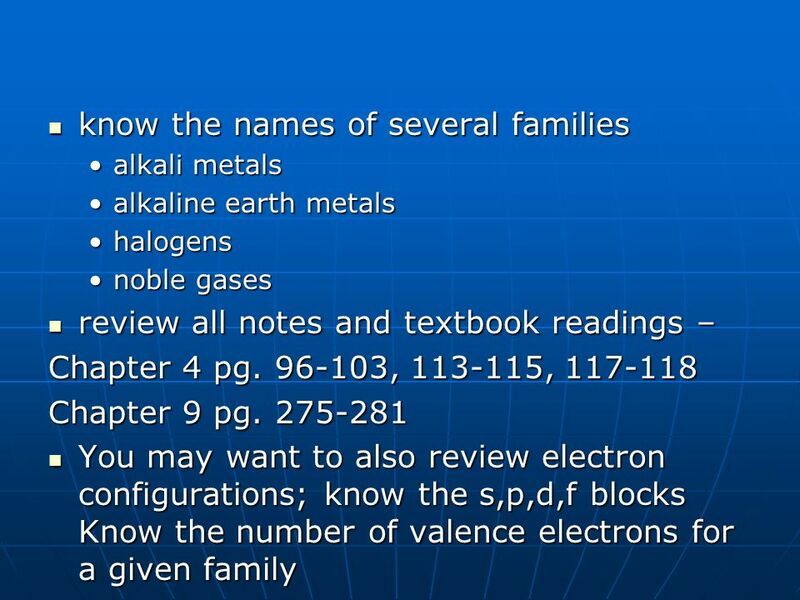 Use textbook pgs to answer the following: Who made the first periodic table? How did he order the. Groups in the Periodic Table. Metal, Non-metal, or Metalloid? Colour or write in the metals, non-metals, and metalloids. Be sure to classify every element. 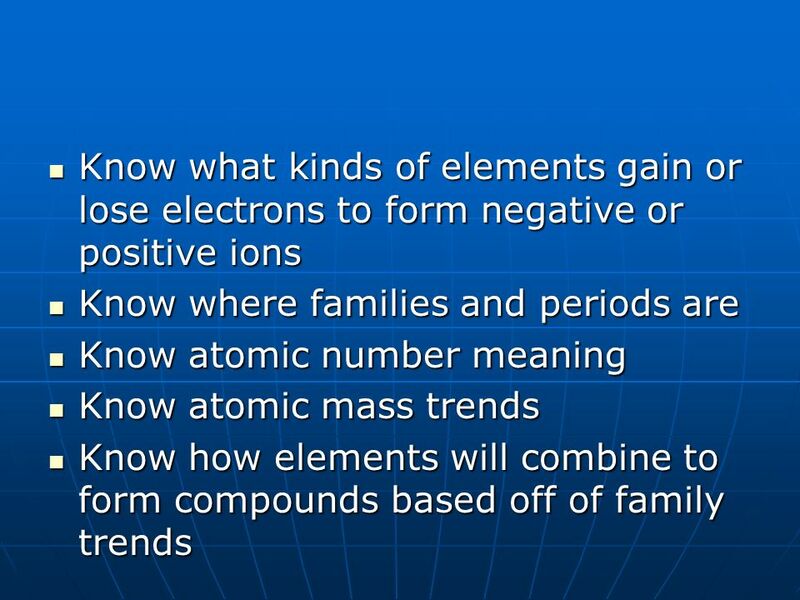 Jeopardy PT HistoryGroupsTrends Metals/ Nonmetals Ions Q $100 Q $200 Q $300 Q $400 Q $500 Q $100 Q $200 Q $300 Q $400 Q $500 Final Jeopardy. Periodic Table Trends and Similarities. Trends of the Periodic Table: At the conclusion of our time together, you should be able to: 1. Give a trend across. PERIODIC TABLE GROUPS FAMILIAR FAMILIES OF THE PERIODIC TABLE. The Periodic Table Chapter 5 Notes. Mendeleev ● Designed first periodic table (1869) ● Arranged mostly by increasing atomic mass ● Elements in the same. PERIODIC TABLE NOTES.  An element is a substance that is made entirely from one type of atom. All of the matter in the universe is made up of different. Periodic Families and Family Properties Mary Same.